← Single Card Tarot Reading – Monday Nov 18, 2013. 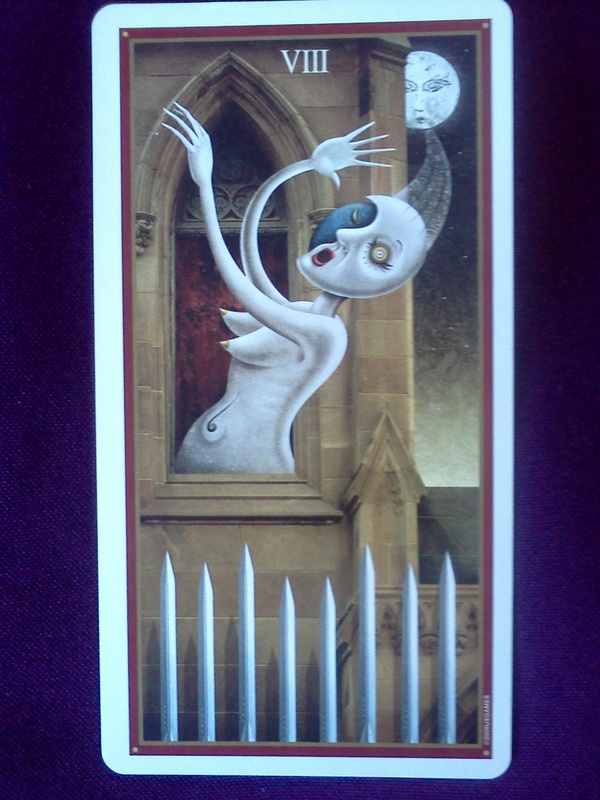 Single Card Tarot Reading – November 19, 2013. Monday we started off with the Two of Swords and it looks like a lot of that energy has carried over into Tuesday, because for Tuesday I drew the Eight of Swords from the Deviant Moon Tarot by Patrick Valenza. You are being pulled or compelled in a particular directions and feel like you have very little control over it. This almost feels like a relapse of some sort, but if its not and issue of substance abuse it could be an indication of another compulsive behavior that one is struggling with, being a workaholic, compulsive spending, people pleasing, addictive negative thought patterns. The key here is the compulsive nature, that feeling like you can’t control your responses. Try to figure out a way to derail that knee-jerk reaction. I’ve been told to visualize a stop sign when I begin to follow that well worn rut of a response. I don’t know about you, but pulling this card for today was intense and a little disturbing for me, especially after the Two of Swords yesterday. I hope if anyone else is feeling unsettled, that they find a way to practice self care and recenter.